Vancouver, British Columbia--(Newsfile Corp. - August 1, 2018) - Sixty North Gold Mines Ltd. (CSE: SXTY) (FSE: 2F4) (OTCQB: SXNTF) (the "Company" or "Sixty North Gold") is pleased to announce that it has recently received the assay results of a prospecting program conducted in 2017. Two parallel dominant gold trends were identified, with lengths over 3 kilometres, and which include the former-producing Mon Gold Mine's A-Zone. Two hundred and fifty grab samples of rock were collected across the property. Thirteen samples exceeded 10 gpt gold with the highest value of a 1 AT fire assay returning 144 gpt gold. Another 48 samples exceeded 1 gpt. All samples were collected outside of the A-Zone, in an attempt to evaluate other gold showings on the property. Readers are cautioned that grab samples are by their nature selective and are not necessarily indicative of the general geology of the property. Ronald Handford, CEO, said: "The Company is very pleased that new gold showings are being discovered and previously recognized showings can be expanded to define kilometre-scale trends. The Company plans to follow up on these trends in our 2018 exploration program with detailed mapping, systematic sampling, and trenching where warranted. We mobilized crews to the property at the beginning of June to commence this work. The 2017 results confirm the broad potential for surface exploration throughout our property, in addition to the potential from the advanced exploration underground bulk sample planned for 2019 at the former-producing A-Zone." Two dominant gold trends containing eight material gold zones, including the A-Zone, have been identified as the Western Mafic Trend (WMT) and Eastern Mafic Trend (EMT). These trends include discrete high grade gold bearing veins, within altered and mineralized host rocks similar in nature to those that host the greater than 1.27 million ounce Measured and Indicated Mineral Resource at GoldMining Inc.'s Ormsby Zone (22,296,000 tonnes grading 1.77 gpt, containing 1,270,000 oz gold; SRK Feasibility Study, 2012). Collaborative work with the Mon Gold Property's adjacent property owners confirms these trends. Mineralization found on the Mon Property that resembles mineralization found on nearby properties does not confirm that this type of mineralization will be of the same size, shape and grade on the Mon Property, it only indicates that there is potential for such mineralization to be found. The WMT and EMT are dominated by gabbro dykes and/or sills transecting Kam Group, Banting Group, or Burwash Formation rocks. Three additional gold zones occur outside of these major trends, two with no gabbroic rock association, and one associated with a separate cluster of gabbro bodies. The WMT hosts a north-northwest-striking three km long series of gold zones (6, 7, 8, 9, and 11). Four of these five gold zones were previously known but not fully investigated. 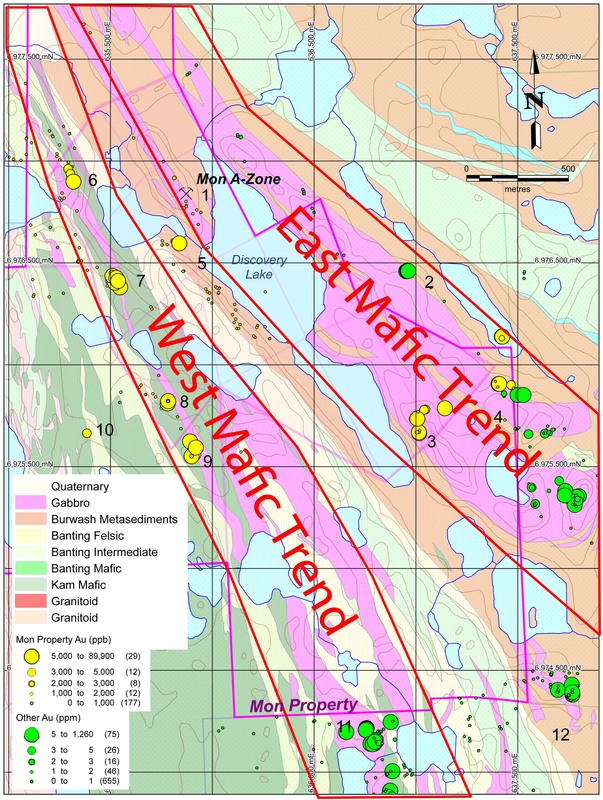 The WMT gold trend occurs 300 m west of the A-Zone within Kam Group mafic igneous rocks. Mineralization consists of a series of subparallel discontinuous quartz veins and altered rocks up to 100 m wide that can be traced discontinuously (constrained by exposure) across much of the property. A total of 103 grab samples were collected along this trend returning an average grade of 2.98 gpt gold. Individual grab samples up to 38.71 gpt were obtained. The EMT hosts the past producing A-Zone as well as other previously recognized mineralization. A 4 m wide zone (3) with narrow quartz veins can be traced for 140 m containing malachite staining and visible gold. Twenty-three samples were collected from this area with an average grade of 6.95 gpt gold with a high value of 144 gpt gold (1AT fire assay). A new gold zone (4) has been discovered 400 m east of this showing, may be consanguineous with it. Six samples collected here have returned average grades of 2.14 gpt gold with a high value of 6.63 gpt gold. A second new showing, 200 m north of the new showing just described yielded average grade of 5.58 gpt with a high value of 9.68 gpt gold from six grab samples. Five hundred and fifty metres northeast of this (2) on an adjacent property, 11 samples returned an average of 25.96 gpt gold with a high value of 210 gpt gold. A previously recognized gold zone (5) hosted between the EMT and WMT is represented by a single grab sample of a sulfide-rich schistose mafic rock that graded 12.88 gpt gold. A new gold showing (10), outside of the two dominant mafic trends, 500m west of the WMT, occurs within Kam Group mafic rocks and is located by a single grab sample grading 4.49 gpt gold. Dr. D.R. Webb, Ph.D., P.Geo., P.Eng. is the Qualified Person for this release within the meaning of NI 43-101 and has reviewed the technical content of this release and has approved its content.